Spring is here! Spring is here… or at least it should be. The weather here has been CRAZY! Today it is 75 degrees and sunny, but later this week they are talking snow in the forecast?!?! Well, I took full advantage of the amazing weather today and was able to get out in the yard to finally till my garden! YAY! I must say though, I have a love/hate relationship with my tiller. I have a Troy-Bilt TB146 EC 12-Inch 29cc 4-Stroke Gas Powered Garden Cultivator/Tiller that I love, but it gives me a workout that is for sure! We have a larger tiller, but that monster will pull me around the yard like a rabid dog, so I like to stick to the little one. It gets the job done so I don’t mind the extra few passes I have to make. So last year I decided that I was going to move my garden to another place in the yard. It was inside the fence line, so it was a hassle to keep the dogs out and chase the goats away from my precious tomato plants. So, this year I moved it to an area outside of the fence line, now all I have to worry about are deer, which shouldn’t be to hard right? Ok, to the point… Because I was going to move it, I had to preparing the soil for planting this year. The soil in the area was not the best to say the least but because I prepared for it, this year my soil is awesome! Don’t worry though, if you are starting out this year, and don’t want to wait an entire year, these tips are for you too! If you know where you are going to place your garden a year in advance be sure to prep the ground. Last year I marked off where the garden was going and tilled the soil. I then tilled in leaves, compost and rabbit poo. Yes, I said rabbit poo. If you don’t have any, it is ok, stick to compost. I raise rabbits so I always have an abundance of poo, if you want some, stop on by and grab it (use gloves though). By tilling the year before I am allowing the soil to absorb all of the nutrients that it needs for the following year. If you didn’t have a chance to prepare the garden the year before, there are steps to help improve your soil this year. I would recommend starting off by checking the PH level of your soil. This will help determine what you need to add in order to improve your soil. I recommend taking the completed test to your local nursery and talking to a professional about what is needed. This can be a difficult task without the right tools, but can be done. It is important to remove the grass and weeds from the area you plan to garden. This can be done with a good ol’ shovel, or a tiller. It is recommend to turn 12 inches of soil when tilling. 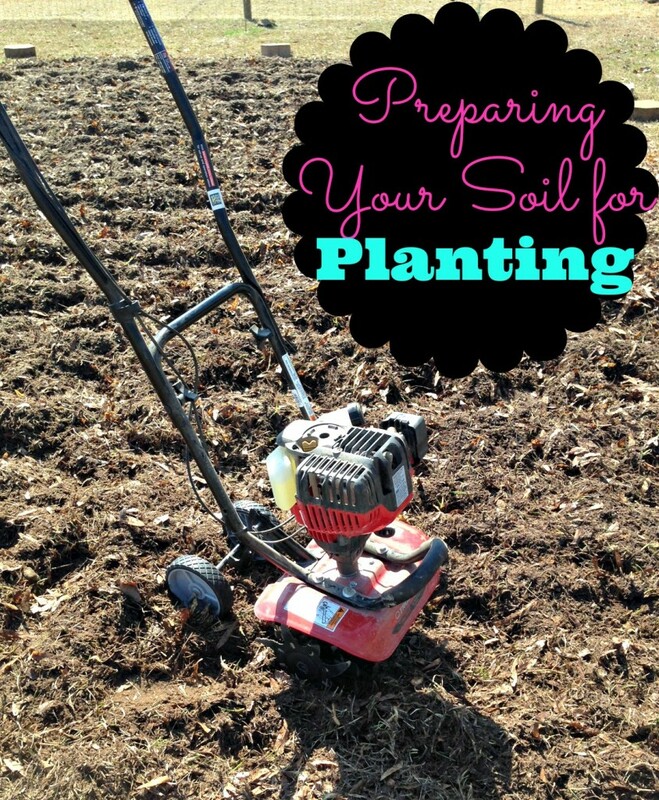 This is the time to add any extras that your soil might be laking as well. Once you have added in your compost and tilled your garden, wait a few days to allow the soil to absorb any of the additives that you have mixed in. At the end of each planting season, remember to remove any dead plants from the garden. Do not leave them to compost down in the garden. Doing this can promote bug infestations and disease. Pull em’ up and tear them out! What are you most excited to plant this year in your garden??? I have never used a tiller a day in my life, although, when I was younger, my parents had an old Victorian home, lots of land, and I remember having a fun time watching. I have a brown thumb, so anything garden related intimidates me. This is my first year trying to make a garden. I have planted a few plants in pots before, but haven’t been very successful. I have put in a 30′ x 4′ raised bed. We had very good top soil brought in to fill it, and had lime brought in today. We don’t have a tiller, so we will be working it in with a shovel. I see lots of hot showers and pain reliever in my future! lol I am going to use your garden guide to mark it off in one foot sections, to get the most out of it. Thanks so much! Invest in some epsom salt. It is good for both your garden, and a in a nice bath to relax after a long day in the garden. =) Good luck on your garden this year and thanks for stopping by!